The power of an American Management Association Project Management seminar — right in your hands! "Each year, thousands of project managers, certified Project Management Professionals (PMPs(r)), and other project-focused professionals enroll in the American Management Association’s project management seminars. Individuals and companies recognize the value of these courses: up-to-date, repeatable project initiatives they can implement throughout their departments and organizations to improve processes, streamline productivity, and drastically reduce costs. Based on one of the most popular of these renowned seminars, Improving Your Project Management Skills is both a practical reference for beginners and a handy refresher for seasoned professionals. 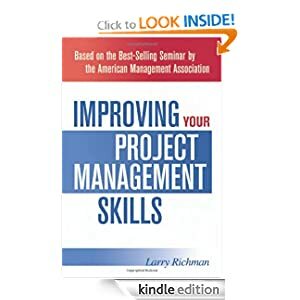 The book covers all the major areas taught in the AMA seminar of the same name: defining project scope, planning and budgeting, scheduling, implementation, project closure, and more. PMP Books PDF PMP Book. permalink.